A new age opera with a kaleidoscope of colorful, exotic and enchanting sounds guaranteed to mesmerize and evoke images of joy, adventure and triumph. With an ethereal mix of neo-classical, jazz, world and pop, this music will captivate you. The following bio was put together by Jeffrey Martin for his November 2, 2002 specialty show "EARTH FEELING". Coming up next music from the self-titled debut cd from Simirillion. A quick peek at the liner notes for this cd reveals that several musicians were involved in the recording, including flute, sax, and trumpet players. But the guitars, keyboards, and percussion, as well as the composing and recording, are the work of one man, New York native Chip Wilson. Although as a kid he says he tinkered around on the family piano, played mostly by his mother, Wilson didn't take up music seriously until he was a teenager, influenced by the guitar masters of the 60's and 70's, Hendrix, Clapton, and Beck. Wilson kicked around in several rock bands, playing the local circuit and even writing a bit of music. A music career never really took off. Fortunately Wilson had a degree in business and supported himself for many years by working with computers. Ironically, it was developments in computer technology that led him back to music and composing in the mid-90's. 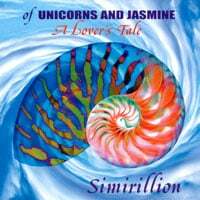 Wilson is currently putting the finishing touches on his next recording (Of Unicorns & Jasmine ...A Lovers Tale), which this time around include several ethnic instruments to give his music a world-fusion flourish.